Following up his blistering attack on Shell and the government’s attitude to the Shell-To-Sea campaign in 2010's The Pipe, Atlantic shows Risteard O'Domhnaill hasn't softened in any way. 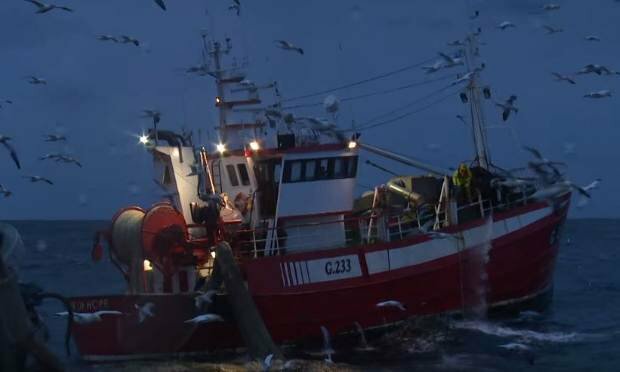 The oil companies are still in his sights but the director casts the net wider, this time exploring the struggles of Irish fisherman under the cosh of EU quotas. Narrated by Brendan Gleeson, Atlantic takes on the plight of fishing communities of Dingle, Aranmore, Ros a Mhill and more, charting their current malaise back to Ireland’s entry to the then EEC; Jack Lynch's Fianna Fail government's opening up of Irish seas to Europe and giving oil companies carte blanche in 1973 was followed by Labour's Justin Keating's attempt to correct this by demanding a hefty/fair return for the use of sovereign waters. This was then in turn reversed by Ray Burke in an act described here as 'economic treason'. Local fisherman like Jerry Early now watch on as a "city of boats" from Spain and the Netherlands light up the night sea while he is hampered by quotas that make it difficult to make a living out of. If that wasn't bad enough, 2006 brought a ban on salmon fishing due to a fall in salmon numbers, which is hotly disputed by those interviewed here; Early is brought to court for his nets which have the ‘potential’ to catch salmon. But O'Domhnaill goes further afield, exploring the devastation the village of Renews, Newfoundland suffered when quotas were introduced in the late eighties/early nineties (the director unearths some wonderfully taut archive footage of protests as the announcement is made). He finds Charlie Kane who explains that a quota of two tonnes "is not even worth catching." Atlantic also makes it to Norway and charismatic Bjornar Nicoailsen and his country’s state-owned oil policy. There’s also an investigation into the effect the oil companies underwater explosions have on marine life. Whenever in danger of getting lost in facts and figures, O'Domhnaill always brings it home, illustrating what all this means for the man in the boat. Despite the heart-tugging stories, Atlantic finds beauty in the sadness with the director breaking up the talking heads with majestic swoops of coastlines.